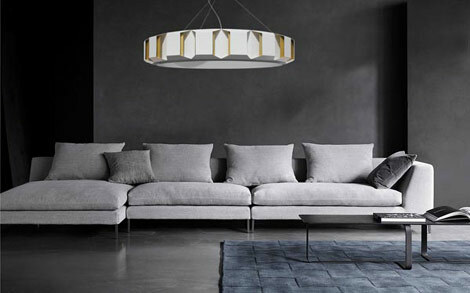 Designed by Martin Huxford, The Aperture Chandelier is a luxurious geometric chandelier, inspired by elaborate folded and faceted modern jewellery, and by the pure sculptural qualities of late 20th century Modernist architecture. The Aperture chandelier is formed of 17 bold architectural elements with jewel like angled facets formed from hand folded metal. Between these origami like modules windows of graduated light cast patterns from multiple hidden LED light sources that lie obscured within this patterned structure. Every Aperture Chandelier is made to order, with a great choice of custom finishes for special projects. 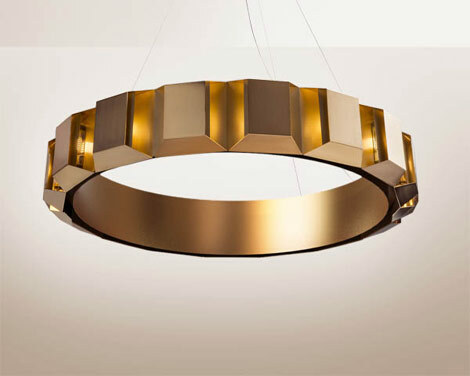 Bespoke metallic finishes with choices of gold, bronze or silver, on satin hand finished metal, highlight the contemporary luxury style of the chandelier. Customised colour options, drawing on the wide choice of RAL colours we have available, to create a unique piece.